The talks that started Monday were the first face-to-face meetings since Trump and his Chinese counterpart, Xi Jinping, agreed on Dec. 1 to suspend further action against each other’s imports for 90 days while they negotiate over U.S. complaints that Beijing steals or pressures companies to hand over technology. Neither side has given any indication its basic position has changed. “Even if a deal is cobbled together, the more strident trade hawks in the White House and Trump may not sign off,” Mizuho Bank’s Vishnu Varathan said in a report. As the trade talks wound down, China’s top economic official, Premier Li Keqiang, met with CEO Elon Musk of electric car brand Tesla Inc.
China is the largest electric vehicle market and is strongly encouraging its development. Last year it ended restrictions on foreign ownership of EV producers to help spur the industry’s growth, and in July Tesla announced plans to build the Gigafactory 3 facility in Shanghai. The U.S. demands strike at the heart of a state-led development model. “These issues are much more difficult to solve immediately but are, frankly, much more compelling to U.S. companies,” said Jake Parker, vice president for China operations of the U.S.-China Business Council, which represents American companies that do business with China. Companies disappointed failures or delays in carrying out Beijing’s commitments want an enforcement mechanism with “some kind of penalty for not doing what they promised,” said Parker. With cooling economic growth raising the urgency for a settlement, this week’s talks went ahead despite tension over the arrest of a Chinese tech executive in Canada on U.S. charges related to possible violations of trade sanctions against Iran. 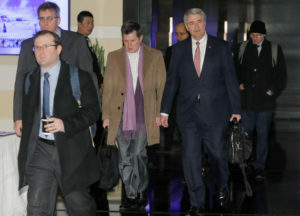 The American delegation was led by one of Lighthizer’s deputies, Jeffrey D. Gerrish. It included agriculture, energy, commerce, treasury and State Department officials.